The birthstone of April is " Diamond"
Diamond from the ancient greek word "adamas" means unbreakable or the "hardest metal". it is also the hardest natural material known, where hardness is defined. Diamond has a hardness of 10 (hardest) on the Mohs scale of mineral hardness. Diamonds are thought to have been first recognized and mined in India along the rivers of Penner, Krishna, & Godavari together with other deposits. 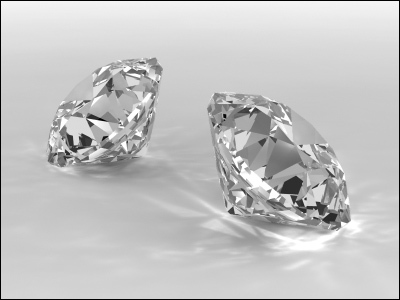 Diamonds have been known in India for at least 3,000 years but most likely 6,000 years. Diamonds is associated with enhancing relationships and inner strengths, as well as Balance, Clarity, Abundance.